Here is an article I wrote this time last year when our former hero Tony Craig left us to return to his first love, Millwall. Give that the Bees travel to the New Den today to pay homage to TC and play against The Lions in his testimonial match I hope nobody minds my putting this blog up again as nothing has really changed in the year since I wrote it and we still feel exactly the same about Tony Craig. He gave us everything and we are totally indebted to him for what he did for us. There was a universal reaction amongst all Brentford supporters to the news that broke yesterday that captain and inspiration Tony Craig had left the club and returned for yet another spell – his fourth including an earlier loan, to Millwall where he will become team captain. It was simply one of thanks and gratitude to TC for the three years of exceptional service he gave us, as well as pleasure and delight that he will now be given the opportunity to play every week, a privilege that would surely have been denied him if he had remained at Griffin Park. Tony made his reputation at Millwall as a tough and committed central defender or left back and he led his team to promotion to the Championship. His arrival at Griffin Park in the summer of 2012 for a fee reputed to be around one hundred and fifty thousand pounds was seen as a real coup for the club and Uwe Rösler soon recognised his leadership ability and named him as captain. Tony played a prominent part in our success over the past three years. He was a real and visible presence on the field – you knew that he was in charge and he set a wonderful example as he never knew when he was beaten. I will always remember him in the prematch huddle, with jaw set, eyes blazing and with his head bobbing up and down like a metronome as he exhorted his team mates to greater efforts and forcefully reminded them of their personal responsibilities. He made it perfectly clear who was in charge on the pitch and what winning the match meant to the club. Woe betide anyone caught shirking or falling short in his task. Once the whistle went he was a human dynamo and set a massive personal example. He never gave up and that long left leg would sneak out to save the day when all otherwise looked lost. Not the tallest of defenders, he timed his leaps well and won more than his fair share of aerial challenges. Most importantly, he read the game brilliantly and could anticipate potential danger and snuff it out before any serious damage occurred. He was indestructible and was rarely injured and shrugged off fearsome assaults that left him covered in blood or cinder rash and would have resulted in lesser men leaving the field. He was our bionic man and a total inspiration. No wonder that his three seasons saw the club rise to almost unprecedented heights of achievement with a promotion and two appearances in the playoffs to add to his already impressive CV. This was no accident and TC played a massive part in ensuring our promotion to the Championship and his central defensive partnership with either Harlee Dean and James Tarkowski was mean and effective. Tony had played previously in the Championship with Millwall and initially he made a seamless transition to the higher level. He also embraced the club’s new found patient and short passing approach to the game and demonstrated calmness and a previously unsuspected and unseen skill on the ball. His left-footedness provided a much needed balance to the back four and he changed the direction of our attack by pinging any number of accurate long range passes to an appreciative and generally unmarked Jota or Odubajo on the right wing. Tony started last season well and was consistent and competent and fully earned his contract extension. He made an inspirational return to his old stamping ground where he received a rapturous welcome from the otherwise subdued Millwall fans and he stood up bravely and brilliantly to Millwall’s aerial bombardment and helped steady the ship and cement our victory after we had conceded two quick goals. However as the season progressed a few chinks began to appear in Tony’s armour as he came up against a seemingly never-ending series of canny, strong and experienced strikers. He struggled and came out second best in his personal battles against exceptionally talented players like Danny Graham, Grant Holt, Rudy Gestede and Daryl Murphy, looked vulnerable to balls played over the top which forced him to turn and Mark Warburton began to rotate his three central defenders as he sought to establish his best pairing. Tony finally lost his place and fittingly made his last appearance for the club in a thrilling victory over eventual Champions, AFC Bournemouth before being forced to settle for a cheerleader’s role on the bench. This was no place for such a legend and with two new central defenders already having arrived at the club in the last couple of weeks, it was obviously best for all concerned that he was allowed to move on and it remains to be seen whether similar experienced players like Alan McCormack, Sam Saunders and Jonathan Douglas, like Craig, mainstays of the promotion team, decide to remain at the club and fight for the opportunity to play against increasingly strong competition, or also recognise that their time has time and that our levels of success and progress have overtaken them. Tony’s disciplinary record was also good although he saw red three times during his spell at the club. An assistant referee bizarrely concluded that he had struck Dave Kitson at a crucial stage in that momentous match at Sheffield United, a decision endorsed by our old friend Keith Stroud. Despite video evidence that seemed to exonerate him, Craig received a devastating three match ban and missed the last two league matches as well as the first playoff game against Swindon. Had he been on the pitch I wonder whether we might have got over the line without recourse to the dreaded playoffs and I am certain that he would have had something to say about Marcello Trotta’s fateful decision to take that penalty kick against Doncaster Rovers! He took one for the team with a last man red card card against Carlisle and then fell foul of Mad Madley when he got on the wrong side of Clayton Donaldson and compounded his error by clutching at his former colleague, conceding a penalty kick and earning an early bath. The most amazing statistic about Tony is that he never scored – and barely looked like doing so in his three seasons at the club. He came the closest when his memorable rasping long-range effort was brilliantly saved by the Peterborough keeper and his header from a corner against Leyton Orient was blocked on the line. He was also clumsily pulled down by Adam Barrett, earning us a spot kick against Gillingham, otherwise his efforts were invariably high, wide and not very handsome. He will best be remembered for his heroic defending against Oldham Athletic in Mark Warburton’s first match as manager when a swift breakaway left him alone facing five opponents as they bore down on the home goal, but Tony was calmness personified and saved the day against seemingly insurmountable odds. Then there was his wide-eyed celebration in front of a jubilant Ealing Road terrace after scoring a perfectly taken and utterly crucial penalty kick thrashed high into the roof of the net in the Swindon playoff second leg shootout, a feat he repeated in a less frenetic atmosphere last season at Dagenham & Redbridge! We forgave him for his lack of prowess and threat in front of the opposition goal, we even overlooked the three own goals he scored in his first season at the club, one of them a perfectly placed unstoppable header from a corner which arched beyond the reach of the helpless Simon Moore and gifted Hartlepool an unlikely last minute equaliser at Griffin Park. Tony Craig epitomises all that is good about professional football. He gave us everything throughout his three years at the club and inspired his team mates to greater heights of achievement. He has returned to his first love and I suspect that he will lead Millwall to promotion – and I will celebrate and raise a glass to him if he does so. Tony Craig will live long in our memory and I thank him and wish him nothing but joy and success in the future. Thanks to Tim Street for this more than generous article and review of my new book, Growing Pains which he published on Get West London yesterday. I had the pleasure of meeting Rebel Bee on Saturday before the Kaiserslautern match and a jolly fine and interesting chap he turned out to be too. 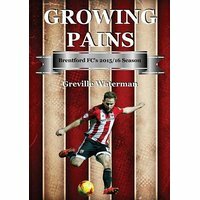 We had a good chat about all things Brentford and it was great, finally, to be able to put a face to a name – or even a pen name in his case! Hopefully I can get together with lots of other readers of this blog at some point during what is certain to be an exciting, if stressful season. 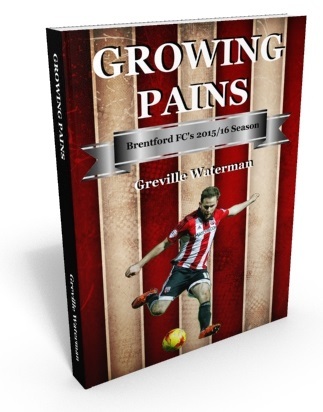 I say stressful as I still find it hard to accept or even believe that the Little Old Brentford that we all knew so well over so many years has transformed itself into a well-run, groundbreaking and innovative club that has set the standard and benchmark for others to follow and is more than holding its own in the Championship, one of the toughest leagues in Europe. Tonight is simply one more step on the journey as we prepare ourselves to meet the challenge of Huddersfield on Saturday week and I will be interested to see how we shape up against a good footballing team in Peterborough. On the face of it not the most attractive or enticing of opponents and I suspect that proposed matches against more vaunted and higher ranked opposition fell through at the last minute. So the Posh it is and anyway, preseason friendlies are all about ourselves rather than the opposition and I am really looking forward to tonight’s action. Oh, in case anyone asks – yes, I do like the new shirts – very nostalgic and once they do something about the illegible numbers I will be more than happy. I really hope that you seek it out and enjoy it. Any feedback and reviews on Anazon would also be really welcomed. Thanks to the two readers who have already reviewed and apparently enjoyed it. It really helps and makes it all worthwhile when you get some feedback – positive or otherwise!